So what do you not like as a child? One of the greens? Broccoli, the poor maligned Brussels sprouts, avocado or, in spite of Popeye, spinach? Or did fish, liver or kidneys turn your stomach? For me semolina is up there along with rice pudding which I still can’t eat to this day. Semolina brings back childhood horrors of school dinners. It looked like a bowl of grey gruel, something akin to Dickin’s day, & had a dollop of raspberry or strawberry jam in the middle, that you could swirl around. The cooks mistakenly thinking that a swirl of red could possibly redeem this dessert. No amount of jam or swirling could make it any way appetising to me. I couldn’t stomach it then & still can’t today. Even worse back then there was a clean plate policy & I recall one time being the last child left in the dining room as I wouldn’t clean my plate. I don’t think I ever did finish it & a kind dinner lady took pity on me & eventually let me leave, plate unclean. However I have come to like semolina in different incarnations. It makes for the crispiest roast potatoes a la Nigella & Ottolenghi makes me a convert with this cake. We all like cake after all! Young or old we all like to have our cake & eat it. And if you are lucky enough to be at a food bloggers afternoon tea party that means lots of cake! To serve: Greek yogurt with one or two drops of orange blossom water. Whisk together the sunflower oil, orange juice, marmalade, eggs & orange peel until marmalade dissolves. In a separate bowl mix together all the dry ingredients. Add dry ingredients to wet ingredients & mix until well combined. The mixture should be quite runny. Grease & line 2 500g / 16oz loaf tins with baking paper. Divide the cake mix evenly between the 2 loaf tins. Pop the cakes in the oven & bake for 45-60 minutes until cooked through. When cooked through a skewer will come out clean & the top will be orangey brown on top. Just before the cakes are fully baked, place the all the ingredients for the syrup in a small saucepan & bring to a boil. Remove from heat. As soon as cakes are baked & out of the oven, start brushing them with hot syrup using a pastry brush. Do this a few times allowing syrup to soak in. Be sure to use all the syrup. Just keep going the cakes will miraculously absorb all the syrup. When the cakes have cooled down remove from loaf tins and cool completely. Serve with Greek yogurt flavoured with a few drops of orange blossom water. This cake is light, aromatic, moist, orangey & syrupy, just quite delightful & I think the best to have your semolina! It certainly beats a school dinner! It is also perfect for a food bloggers tea party. 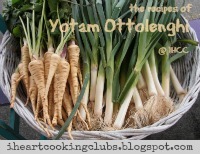 And for more Ottolenghi inspiration head over here to I Heart Cooking Clubs. I can attest that this is a seriously good cake! Ahh I love the colour on the cake -you have me drooling! It looked like a lovely tea party with all of those delicious treats and that cake would have fit in beautifully. I loved this cake and your post has reminded me of that. I really must make it again soon. It was Zosia, get a few food bloggers together for afternoon tea & you have a quite delectable feast! Such fun Deb! Especially with a bunch of food bloggers who are exceptional bakers :) I am with you on the cooked grains....can't do any of them!! And grits...just don't get it! This is such a beautiful cake! I like semolina cakes and have not eaten one in ages! And I like your pretty cup and saucer! I feel your semolina pain of childhood. Glad that you've found an altogether tastier way of enjoying it these days. That cake looks wonderous. Thanks! Yes not the most pleasant of memories....certainly left a semolina scar! But this is most definitely a great way to eat semolina. Semolina, sago, rice pudding, porridge - all have the "barf factor" for me, but I loved this cake too - it definitely made that semolina very palatable. Completely agree Sue & that is the perfect way to sum it up "barf" Wish you could have been at afternoon tea too! 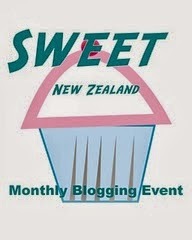 Surely a trip to Auckland should be on the cards for some food filled adventures!! Mmm, just made this with redcurrant jelly (since I had some randomly) and lime zest in place of marmalade. Super yummy, thanks for sharing! This cake does look syrupy and moist. If this didn't get you to like semolina, I don't know what would! Thanks Michelle, this definitely got me over my distaste for semolina that & Nigella's roast spuds! Your photos of this cake are so pretty and feminine. The aroma of anything orange is simply intoxicating to me. That's what I think of when I look read this post. Gorgeous! Thanks Kim :) Orange certainly makes for a great cake!